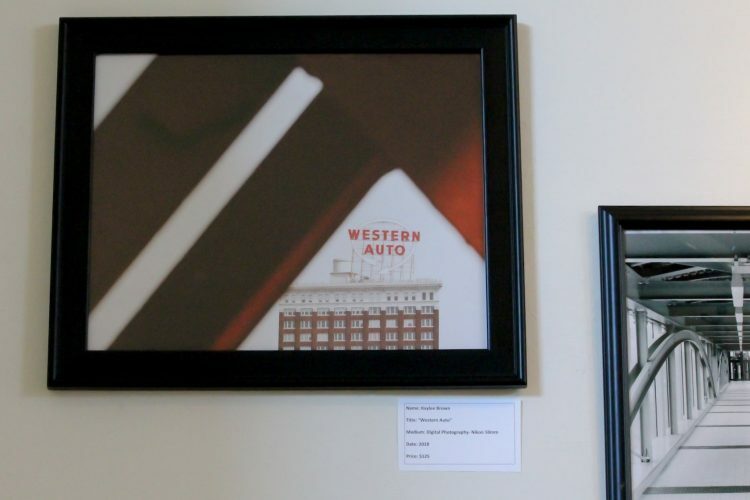 Every year, William Jewell College’s studio art majors and minors display 12 art pieces in Stocksdale Gallery as part of their capstone project; the pieces feature an array of mediums selected by the artist and can be from any of their years in the department. 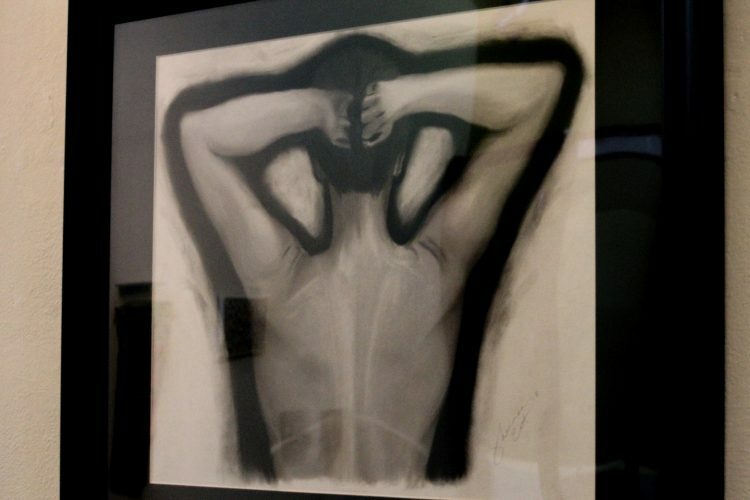 Studio art majors have to set and follow a theme for all the pieces, but minors can choose to display any of their pieces. 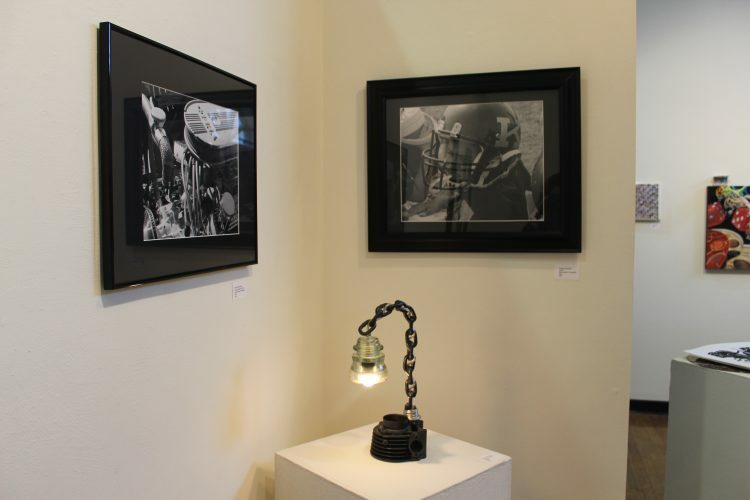 The Senior Art Showcase opened April 15 and will run through May 7. This year’s senior artists are chemistry and studio art major Jesse Lundervold, studio art major Kristina Clevenger, studio art and secondary education major Kaylee Brown and business administration and Applied Critical Thought and Inquiry major and studio art minor Shannon Ernst. Lundervold said the show is an expression of her four years in the art department and a way to display her growth as an artist. Through the art department, she was exposed to different mediums and is displaying a variety of them in her show. Following her rural Missouri theme, Lundervold uses film photography, oil paintings and reduction prints to bring to life her experience growing up near her family farm. 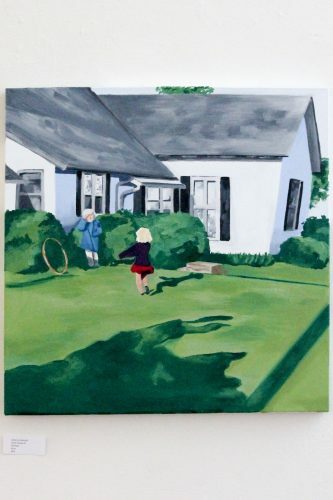 Her favorite piece is an oil painting she made this semester called “Farm House #1.” The painting is based on a childhood photo of Lundervold and her grandma on the family farm. “It’s a memory that I have of living near my family farm, but also just of my experience as a child in rural Missouri. And so I really like how it turned out and I love the color. Yeah. I’m very proud of it,” said Lundervold. “It was fun, I was out with friends for that day, and we found this bridge. It was kind of hidden and it happened to just kind of frame Western Auto. And I love that building anyways, so I thought it was a cool find,” said Brown. Clevenger’s theme was recycling. Many of her pieces are made from recycled objects. “I feel our world of mass-production has left an overabundance of material that can be transformed and fabricated into innovative aesthetically appealing works of art,” said Clevenger in her artist statement. Clevenger said the Jewell art department helped her expand her horizons. Prior to attending Jewell, she had never welded or developed her own film in a dark room. 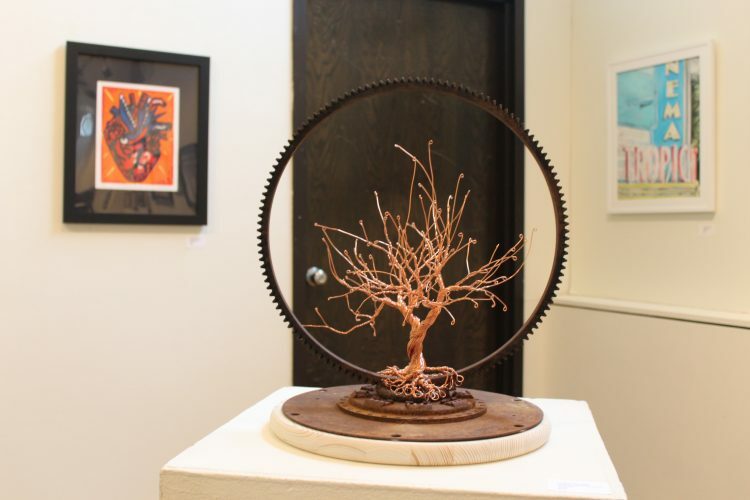 Two of her most popular displayed pieces, “Industrial Ambiance” and “I wonder about the trees?” required welding. Ernst was also able to branch out at Jewell. She said her favorite medium is clay, but since Jewell does not offer an extensive ceramics program, she has experimented with other mediums. “I have had to go outside of my comfort zone, and I’ve really learned to love pastels,” said Ernst. “It’s of one of my best friends, so it just means a lot to me in multiple facets,” said Ernst. The four artists all have various plans for their futures in art. Brown recently signed a contract to be an art teacher in the Independence School District. Ernst said art will be a hobby in her near future but hopes to eventually open her own ceramics studio. Clevenger said she will open an Etsy shop to sell her work. Lundervold wants to keep taking art classes and producing art in the near future and eventually wants to combine her chemistry and art majors by working in art conservation.